The American League’s starting outfield for next week’s All-Star Game certainly isn’t lacking in star power, with the Los Angeles Angels‘ Mike Trout, New York‘s Aaron Judge and Boston‘s Mookie Betts getting the nods. The Red Sox have the second starter in designated hitter J.D. Martinez. The Atlanta Braves and Chicago Cubs lead the National League’s roster with two starters apiece. 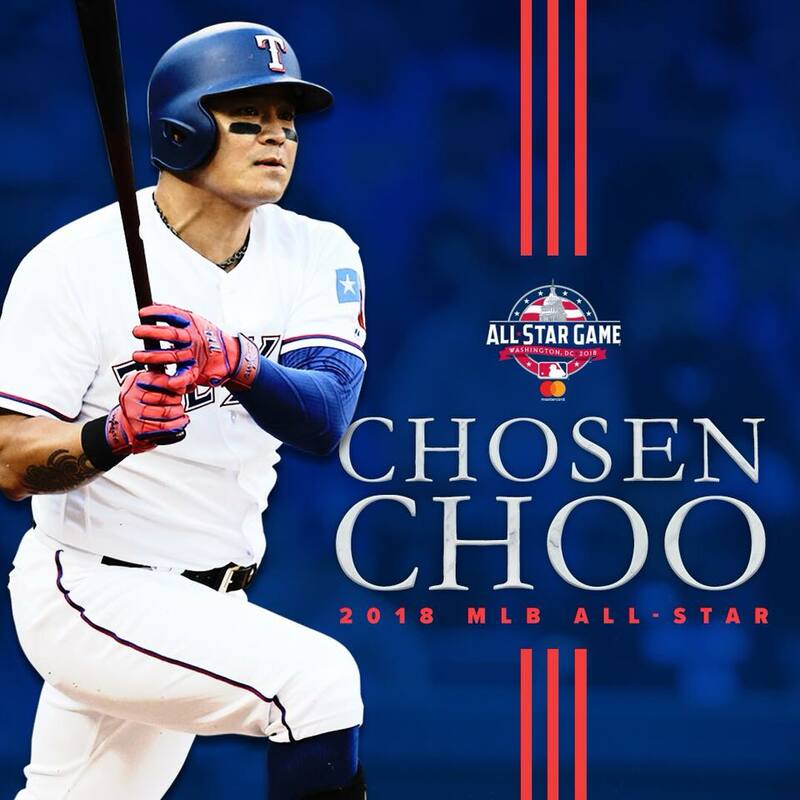 Rangers outfielder Shin-Soo Choo, having set a club record for reaching base in 47 consecutive games, is going to his first All-Star game. Choo was selected as a reserve for the AL. His first All-Star selection comes 14 years after signing with the Mariners in 2005. Rangers outfielder Shin-Soo Choo, having set a club record for reaching base in 47 consecutive games, is going to his first All-Star Game. Austin Bibens-Dirkx faced the minimum through five innings on his way to 5 1/3 scoreless innings, and the bullpen finishes the job to earn Texas a split in Detroit. The Tigers’ Michael Fulmer went seven strong innings but a first-inning homer by Jurickson Profar was all the Rangers needed they also put up a 2 run second. The Rangers won it 3-0. They begin a 3 game series with Boston tonight. Saying he is “humbled” and “honored,” guard Devin Booker signed a five-year, $158 million maximum contract extension with the Phoenix Suns on Saturday. Booker, 21, has rapidly developed into the Suns’ cornerstone star and the franchise’s hope to lead it out of the lottery and back to the NBA playoffs. In 2017, Booker became the first player in franchise history to score 70 points, doing so against the Boston Celtics in a March 24 game. Booker averaged 24.9 points per game in his third NBA season. Former UCLA and Sacramento Kings basketball player Tyler Honeycutt has died following an exchange of gunfire with Los Angeles police Friday night. A family member on Saturday confirmed that Honeycutt had died. The Los Angeles Police Department says it responded Friday afternoon to a report of a man with a gun, and during the initial encounter, the suspect fired a shot out of a residence and officers returned fire. The Cleveland Browns were set to start the season without offensive lineman Donald Stephenson given his two-game suspension for violating the league’s Policy and Program for Substances of Abuse. Now, the Browns won’t have Stephenson for the rest of the regular season. They placed Stephenson on the reserve/retired list, the team announced Friday. He originally entered the league in 2012 out of Oklahoma as a third-round pick with the Kansas City Chiefs, and then spent the past two seasons with the Denver Broncos. Honoring the man who paved the way for dozens of daredevils, Travis Pastrana succeeded in triplicating three of Evel Knievel’s iconic motorcycle jumps Sunday night. Donning his own Knievel-like costume, Pastrana used an Indian Scout FTR750 to jump 143 feet to clear 52 crushed cars and 192 feet over 16 Greyhound buses and concluded the “Evel Live” event on the History Channel by jumping 149 feet to clear the fountains at Caesars Palace.